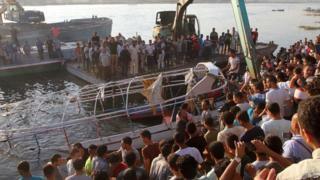 At least 21 people have been killed in a crash between a cargo vessel and a passenger boat on Egypt's River Nile, security sources say. Families of a young couple hired the boat for an engagement party and were sailing north of Cairo when it was hit late on Wednesday, reports say. Five people were rescued. The captain of the cargo boat has been arrested. It is not clear if the couple thought to be celebrating their engagement were among the casualties. Relatives of the dead and missing gathered on the banks of the river to await news of their loved ones. Ahmed Helmy said at least five of his family members died. "Two children are missing," he was quoted as saying by the AFP news agency. The wreckage of the boat has now been removed from the water by recovery teams.